Wake up fairly early, grind coffee with my manual burr grinder, and get that going. Since I’ve printed out my recipe and measurements the night before, I double check that I have everything I need: water, grains, hops, mineral additions, etc. By this point, the coffee is done brewing. I drink it black. Coffee in hand I start heating the water and cleaning/sanitizing whatever needs to be cleaned, which typically only involves cleaning out the mash tun (I don’t sanitize this). My mash tun utilizes a bazooka screen as its filter. Once the water is around 180F, I dump it in my mash tun and seal it up for five minutes to let the interior of the mash tun warm up. Then, I open the mash tun and let it cool to my target temperature. Add grains, stir with my giant whisk, check temp, pull a pH sample, seal it up, stir every twenty minutes. I usually lose a degree or two over the course of the hour long mash. Drain, vorlauf, sparge, begin boil. Pretty straight forward. I love on the second floor of an apartment building, and I’m a stove-top brewer (not for much longer unfortunately). And, for the hell of it, I really enjoy high gravity beers and end up making 6 gallon batches on those big brew days. That means that after my sparge, I’m left with about 26 pounds of spent grain in my mash tun. Usually, I’ll scoop the grain into a trash bag, put the trash bag in the cooler (in case it breaks), carry it all down the stairs, across the parking lot, and dump everything in the dumpster. It is a pain, but the best method I have right now. The bazooka screen I’m using has also had a stuck sparge or two, isn’t that fine a mesh, but to its credit hasn’t been crushed at all despite everything I put it through. 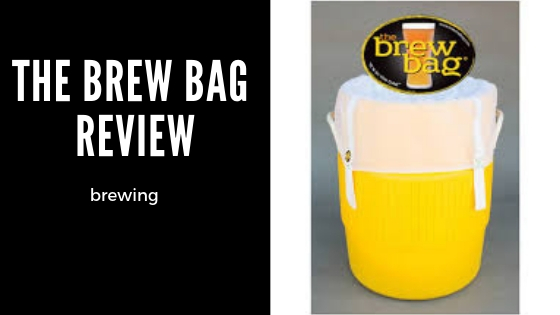 While coordinating some awesome sponsors for the Reddit Homebrewing Competition, I was contacted by Rex of The Brew Bag who asked if I’d like to review a Brew Bag. I don’t have any ads or affiliate links on this blog, so I’m skeptical to review things, but I’d been wanting to give a Brew Bag a shot after reading reviews from Brulosophy and Brew United, so I agreed and Rex shipped me a Brew Bag to try out. The Brew Bag (aka Rex) is also a sponsor of the Reddit Homebrewing Competition this year and is offering three brew bags (any size) and 3 pairs of gloves. Awesome deal, so if you’re entering the competition check out the reviews to learn more! For this brew day, I made an American Stout with the intention of fermenting the wort on charred oak cubes. Luckily, the Brew Bag arrived at my house the day before I intended to brew so I was prepared to give it a shot, I removed the bazooka screen from my mash tun that same night. It isn’t what I expected. It was custom to the size of my mash tun, which was cool, but I had expected it to be something closer to a large muslin bag, but the mesh in the brew bag is light and incredibly tightly woven. I can’t imagine any grains slipping through it. Unfortunately, I made a mistake pretty early on. I poured my heated water into my mash tun and went to take a temperature reading. I’m a fairly clumsy human being, I’m increasingly surprised I’m allowed to handle glass, and I just wasn’t paying attention. When I put my thermometer into the water, it punctured the Brew Bag a bit. It doesn’t take much pressure from a thermometer to puncture the mesh bag, but it was a small hole and I wasn’t worried. I mashed in, used my whisk, and all was well. When I drained my mash tun, I didn’t remove the brew bag since I would be adding sparge water. At first, I opened the ball valve and nothing came out, it took me a second tor realize that the bag was blocking the valve. I opened the mash tun and pulled the two handle from the front of the cooler to the back, pulling the grain to the back along with it, and closed the mash tun on the handles. Worked like a charm. I prepared to vorlauf, and immediately abandoned the idea once I started. There wasn’t a single grain in the liquid, color me impressed. This thing really got the job done. I ended up collecting more volume than I had anticipated, most likely a consequence of failing to adjust my equipment profile to account for the bag. Not a big deal, but I ended up with 6 gallons of wort post-boil rather than 5.5, but still ended up getting slightly above my intended OG (got 1.056, wanted 1.055). This took my typical 72% efficiency to about 78%, which is awesome. Clean-up was basically heaven. I told you earlier about my typical pain of a process. This time around, I just picked up the cooler, walked it down to the dumpster, and turned the grain bag inside out. Sure, carrying it is a pain, but it was simple and quick. This alone sold me on it. Pretty durable when it comes to grain. The hole I made with me thermometer didn’t stretch any bigger, but this may be because I didn’t really apply more pressure to it. Works really well. I didn’t have a single grain in the boil, it was fantastic. Clean up is super simple. My efficiency went up, which is great, and it will be even better when I have adjusted my equipment to use the bag. You can poke a hole in it pretty easily. I didn’t jab it with the thermometer, and the bag wasn’t under any kind of stress when I poked the hole. It’s possible that, if a grain caught it the right way, that the same thing could happen. Pricey. They really aren’t that much money, but compared to a bazooka screen or a stainless steel mesh? This thing is a little expensive. The Brew Bag is an awesome product. It is well made, seems to be sturdy when it comes to grain, and delivers on its promises. I would absolutely recommend it to someone who is just getting into all-grain, or anyone looking to build a new mash tun. I see myself using this until it wears out (if ever), and even then I’ll probably buy a new one. Only time I don’t think I would be using it is if I ended up going electric. Rex, this product is amazing, way to go! Couldn’t recommend this product more if you’re in the market to BIAB or Mash In a Bag. Check out the Brew Bag at the website, and show Rex some love for being a sponsor of the Reddit Homebrewing Competition!